Construction of a $50 million development at Victoria’s Lorne Country Club is set to commence later this year and would see the current nine-hole layout renovated and an additional nine holes added. “It’s been in the pipeline for the best part of a decade,” said Ross Perrett, who would spearhead the overhaul of the course layout as part of Thomson Perrett Golf Course Architects. The Osprey development would involve construction of 99 apartments, a Chifley hotel, day spa, pool, bar restaurant, new tennis courts and parking space. Construction can only commence once sufficient pre sales of apartments have been made, which could occur as early as spring. Managing director of Experience The Otways, Adam Adamczyk, and wife Tracey, have worked tirelessly with Lorne Country Club for 10 years to secure building permits and ensure the development would go ahead. “The club always had a vision to create an 18-hole course but it was always limited by finance,” he said. Adamczyk said the Surf Coast Council had been largely supportive of the proposed development but initially didn’t want the extra nine holes built because it would require removal of native vegetation. Osprey, as the residential development is known, would be built on the first half of the existing par-five first hole and the area immediately to its left. The additional nine holes would comprise seven new holes in the steep hills above and to the left of the current first hole and two new holes squeezed into the land of the current nine. “It’s not an overly long course, I think it’s a par (69),” Perrett said. Perrett said the additional holes would provide a unique experience for golfers. “It’s a pretty stunning bit of land (with) stunning scenery,” he said. Perrett predicted the experience of the future third and fourth holes – back-to-back par-threes of 160 and 120 metres respectively – would be similar to the dramatic par-three seventh at the National Old Course overlooking Bass Strait. “Some of the land that we’re going into up above is very attractive,” Perrett said. The current third, fourth, sixth and eighth would remain largely unchanged but multiple bunkers would be added to each. The current par-four seventh would be lengthened to become the 485-metre par-five 10th and would protrude onto the bottom of the current first fairway. Par-threes would be added at the rear of the current first and to the right of the current par-three fifth. The current par-three second would be re-angled to become the 255m par-four 12th and the current fifth would also be lengthened to become the 235m par-four 15th. “The ninth stays the same but there’s a bit of argy-bargy around the first and second and the first nine’s much the same as it is at the moment in layout,” Perrett said. Sacrificing the spectacular first hole would be necessary for the improvement of the layout according to Perrett. “That’s disappointing but often we have to make trade-offs like that,” Perrett said. 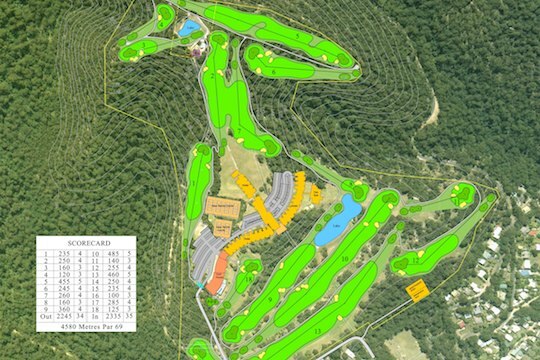 Perrett said that the current layout is enjoyable to play but the 18-hole redevelopment would be an improvement. “It’s a fun weekend course (and) there are a lot of guys I know who love playing it,” he said.